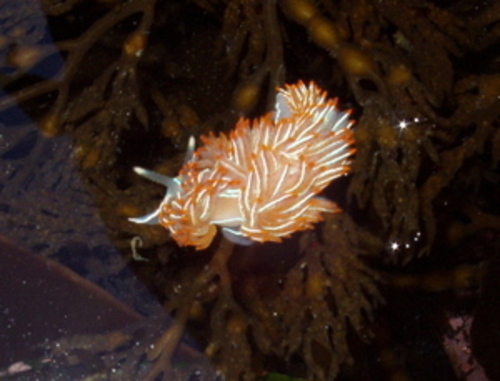 The Hermissenda (Hermissenda crassicornis) is my favorite nudibranch. 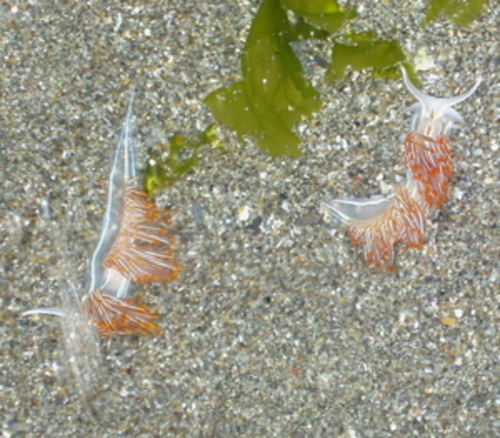 It only grows to 3" long, but its' translucent body, bright orange cerata, and blue markings make it a spectacular find in the tide-pools. Hermissendas are very aggressive carnivores, preying upon small anemones, sea squirts, worms, and more. One of the Hermissendas in the photo below was biting the other when we discovered them at Lone Ranch, just north of Brookings. We have since read that they bite each other when defending their feeding area.